During the previous weekend, a story appeared in several news outlets (e.g. 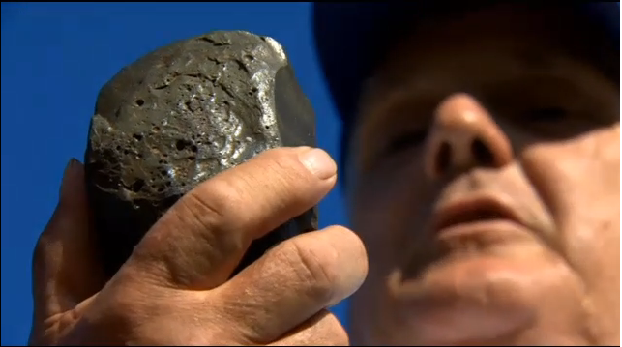 here and here and here) in which a man from Amesbury, Massachusetts, claims to have found a strange rock in a riverbed which "NASA" (according to the story) next identified as either a piece of the Russian space station MIR or a piece of "MIR era space debris" (the latter depending on the news outlet). MIR was a Russian Space Station, in many ways the fore-runner of the ISS, which was de-orbited in March 2001. While the story was quickly and uncritically proliferated by several news outlets (even RIA Novosti), many space and satellite buffs (including this blog's author) were suspicious of the claims right away. 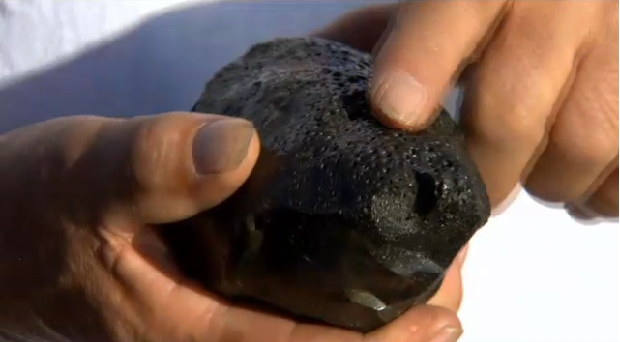 The object, a glassy piece of rock, looked nothing like a genuine piece of space debris. And the specific link to MIR or a MIR-era Russian spacecraft seemed dubious in the absence of a recognizable machine part morphology or machine part registration number. 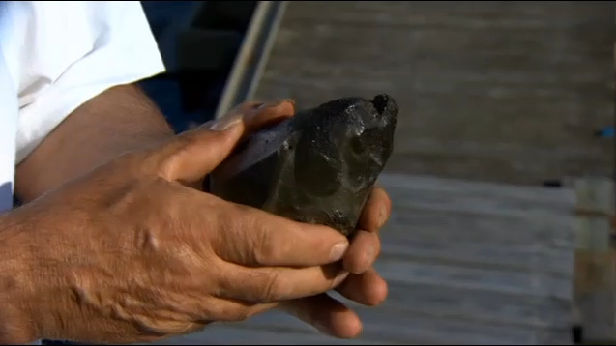 The man who reportedly found it, claims he picked it up from the mud at low tide several years ago at a point where his backyard touches on the banks of the Merrimack river. 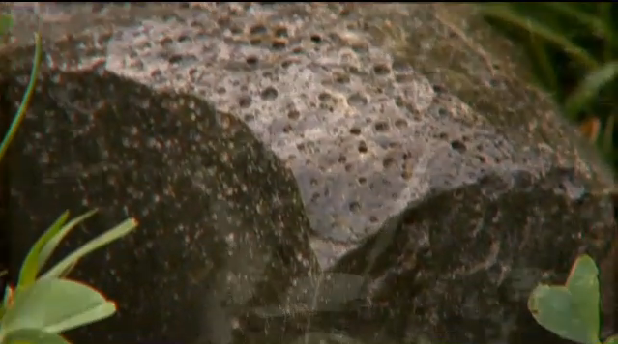 It was a greenish glassy rock "covered in mud". He put it under a tree in his yard where it sat for several years until his sister in law, who knew someone at NASA, sent it to that person for analysis. Or so the story goes. Many months later, the object was returned with a letter purporting to be from a NASA engineer called "George Leussis". In this letter it was identified as "a piece of MIR" or ballast from a MIR-era Russian spacecraft. But is it? To be frank: most likely it is not. First of all, while ballast is sometimes indeed added to space launches (to let the launch mass match the rocket performance), this is not in the form of rock. Such ballast is usually water (in a tank), sand, or metal. And glass is not a major component of spacecraft (glass fiber is though). Certainly not in seizable chunks. More important than that: what are the reasons to think this is space debris in the first place? It doesn't look like a part of a spacecraft at all. It looks like a glassy rock. 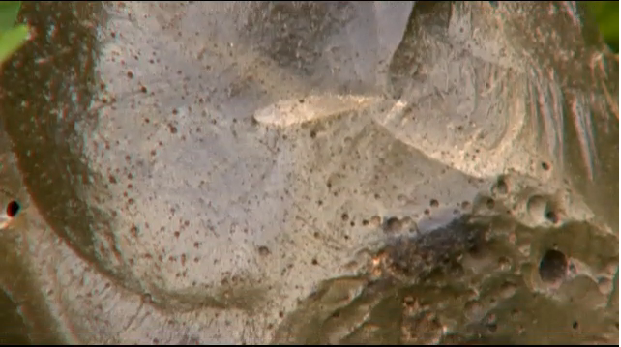 The piece looks like a silicate glass, with clear signs of weathering (e.g. the pitting on the surface, the dull glossy shine), and clear conchoidal flaking (best seen on the third picture above). Contrary to the impression given by the news reports, I can see no evidence of a "fiery entry through the atmosphere" on the pictures of the piece. It looks like a smelt alright, but contrary to what many people think that is not what you get from an atmospheric reentry. Pieces will ablate and will get a thin fusion crust (thin melt layer) just like meteorites, but they do not melt completely and next solidify into a clump again. The conchoidal fracturing certainly would have to have taken place after any melting, and given that the flaked surface has the same green-brown colour there, the latter colour is certainly not due to any superficial burning. 2) a piece of industrial silicate slag. The first is a natural material: the second is man-made waste. Both basically consist of solidified clumps of glass and often have a dark blackish, greyish, brownish or greenish colour. They can show flow lines in the glass, vesicles, and are subject to weathering phenomena that include surface pitting from dissolution. All of which can be seen on the pictures of the object in question. So what actually traces this clump of silicate melt to the Russian space program rather than a more earthly origin? The short answer: apparently nothing. A molten silicate is not unique to products of the Russian space program. In fact it is not likely to be a product of any space program. It is very ubiquitous on earth as industrial waste, as volcanic product etcetera. Only if a geologist can ascertain the object is none of those, then one can think of another, more wilder and rare origin - such as Russian space "ballast". Note that none of the news stories mentions a geologist looking at the object - they only mention a NASA engineer (but: see below!). The next claim in the story is the specific link to the Russian space program (rather than space debris in general) - Mir or Progress. In the absence of a recognizable morphology or a machine part number, this link is completely uncorroborated. At the least, I would like to see a clear chemical analysis with an argument why the composition would uniquely point to the Russian space program, as opposed to a common terrestrial origin (i.e. 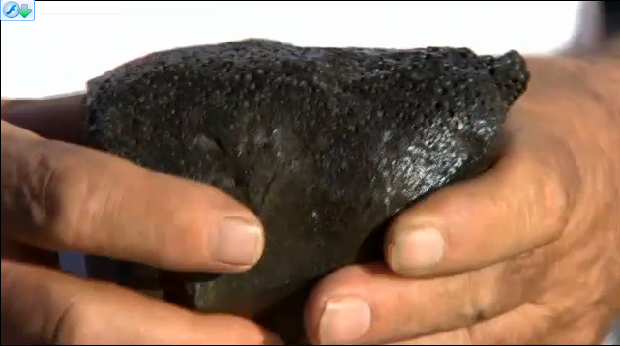 an industrial slag or a volcanic glass). The letter quoted in one of the news articles claims such, but in vague and ambiguous wording. It seems to say the material is terrestrial, and only the "green colour and strange properties" according to the letter point to it having been "subjected to a fall from low Earth orbit". The green colour is however certainly not unusual for industrial silicate slag and volcanic glass, and I see no "strange properties" in the published images of the rock nor the descriptions of the rock that would point to it having experienced an atmospheric entry (or would be unusual for an industrial silicate slag or volcanic glass). Moreover: the apparent "letter from NASA" has since come under suspicion. For here is the clincher: it is claimed that the identification was made by a NASA engineer called George Luessis. An engineer called George Luessis indeed works for NASA (he was part of the Chandra project), BUT: upon being asked by Harvard astrophysicist and space buff Jonathan McDowell, he denies any knowledge of this object and the letter and says he didn't make this identification. So who did make that identification then? Who wrote that letter, if truely there is a letter? Another engineer called George Luessis working for NASA? Basically, at this point this whole story is falling to (green, glassy) pieces. The rock looks like material that is ubiquitous on Earth. There is nothing in the morphology to link it to a Space Program (let alone the Russian Space Program), i.e. nothing in the composition and morphology to think it is space debris. In fact, there is much in the morphology that makes that highly unlikely. And it is not clear who at NASA, if anyone at all, analysed the rock and "identified" it as "space debris". There is/was a George Luessis working at NASA, but it was not him. So who? 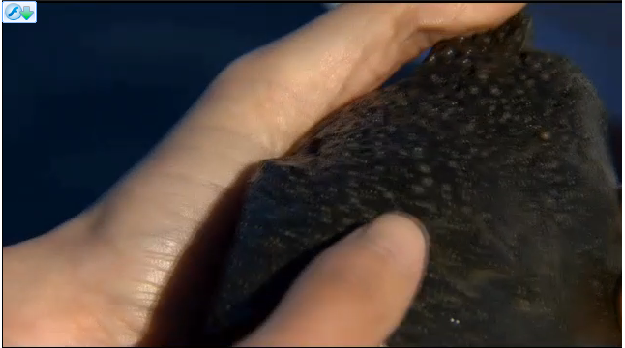 It can be seriously doubted that this green glassy rock is a piece of space debris. There is not a shred of verifiable evidence for it and much speaks against it. 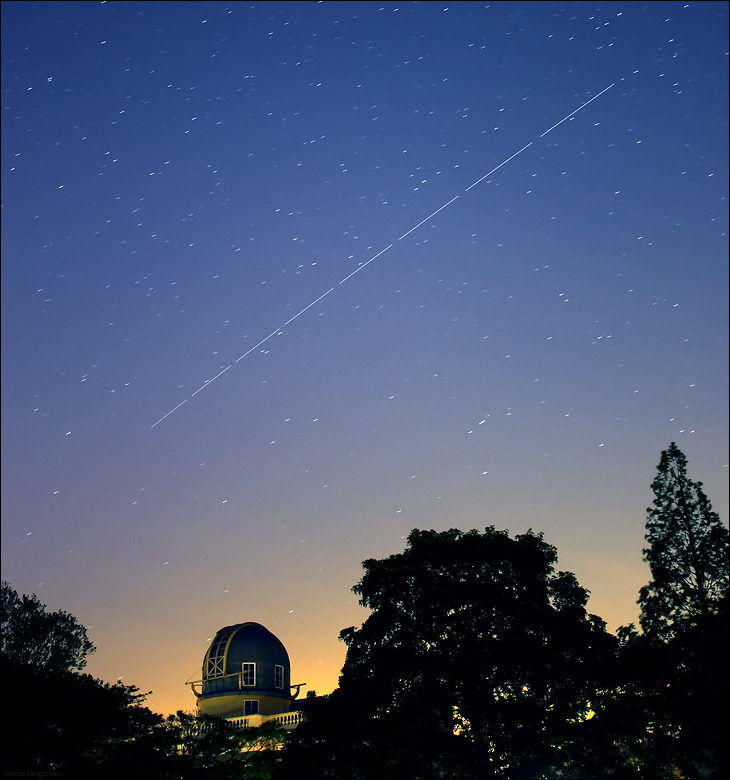 On June 13, 2013, near 6:05 pm local time (AEST - corresponding to 10:05 UTC), many people in Eastern Australia observed a bright fast light falling down in the sky. It was even recorded by one of those new-fangled dashboard-cams (one of these days, I must get me one for my bike). The Australian news website "The Chronicle" claims it was a satellite decay - more exactly, that of the Russian Molniya platform Molniya 3-53 (2003-029A). It was however most definitely not a satellite decay. All descriptions talk about a fast object. The dashcam video shows a pretty fast fireball indeed. It is much too fast to be a decaying satellite. The latter move at relatively slow speeds - 8.5 km/s. At that speed, it takes them several minutes to traverse your sky, not just a few seconds. As low over the horizon as the dashcam video shows it, it would have been very, very slow, taking several tens of seconds to traverse the distance it does in the video. In addition to it being too fast to be a satellite decay, the proposed connection to Molniya 3-53 can be rejected right away. Now, given that the apogee of the satellite was at a very low altitude already, could it have been the case that it briefly started to burn but survived after it passed perigee? The answer is "no" in this case and brings us to a second point against the identification with this satellite: Molniya 3-53 was not over Australia at June 13, 10:05 UTC. It was at very high altitude over Northern Europe at that time (see map below). 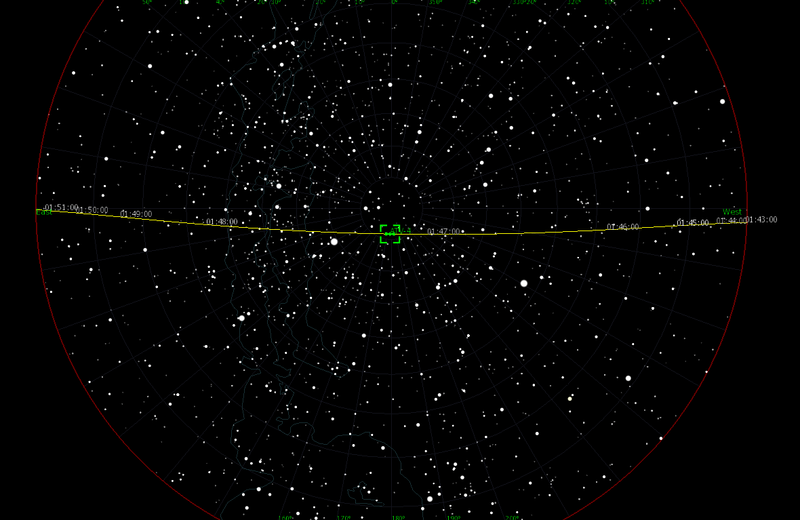 It would not pass over (central) Australia untill 10:55 UTC (6:55 pm AEST), i.e. a full hour later than the fireball sighting. So what was it then? Given the speed, it is very clear this was a meteoric fireball, a small piece of cosmic rock or ice (debris from a comet or an asteroid) entering the atmosphere. After a few cloudy and rainy days, it miraculously cleared in the afternoon of the 14th. This allowed me a last view on the ATV-4 before docking to the International Space Station ISS. 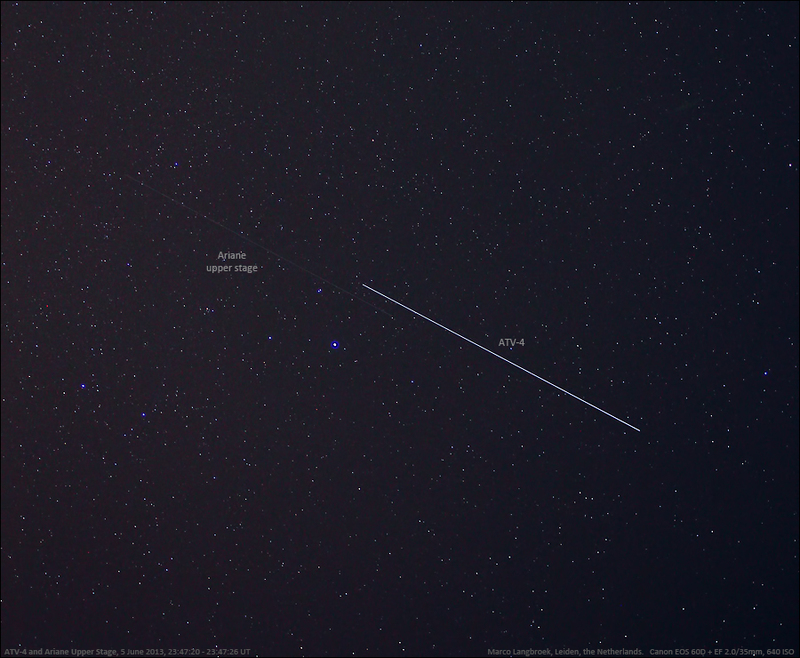 The next pass was under a darker sky, at 00:32 local time (22:32 UT). I walked a few tens of yards to the city moat to see it (I have better view at low elevations there). ISS and ATV-4 attained a maximum elevation of 28 degrees in the S-SW. The photograph above is from that pass. Using the 2.8/17-50 mm Tamron at the 17 mm setting, I could just catch ISS and ATV in one image - with a stray old Russian military satellite as a bonus (Kosmos 1315 (1981-103A), a defunct Tselina-D ELINT launched in 1981. A Japanese H-2A r/b briefly became bright as well and is visible in some images (but not the one above). I had also set up the video, filming from my GF's appartment. 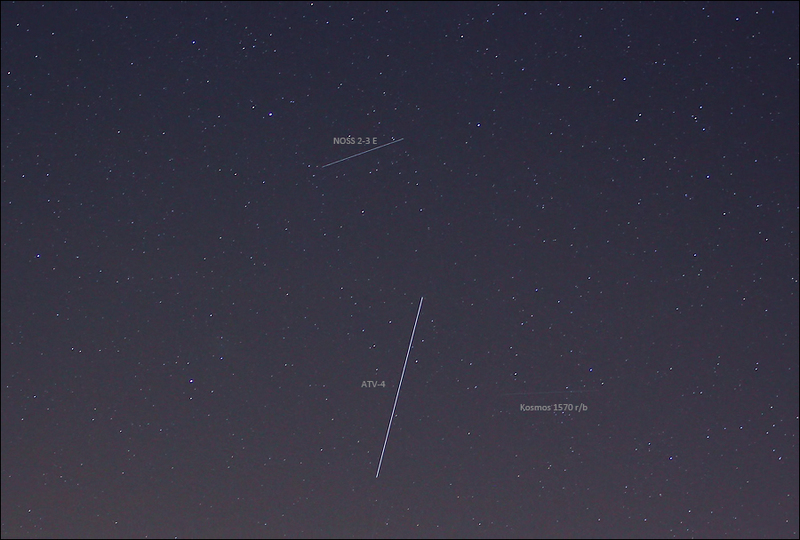 About 16 minutes before the ISS pass, I filmed Progress M-19M (2013-007A). This cargoship, now filled with trash, was undocked from the ISS a few days ago to make room for the ATV. It will reenter on June 19th. In the video above, while the Progess is passing, look for a brief bright flash just below the image center at 22:13:36. This is a flashing geostationary satellite (probably NSTAR A, 1995-044A). The video next cuts to the ISS pass 16 minutes later, followed by ATV-4 and a couple of bats in the last seconds of the video. 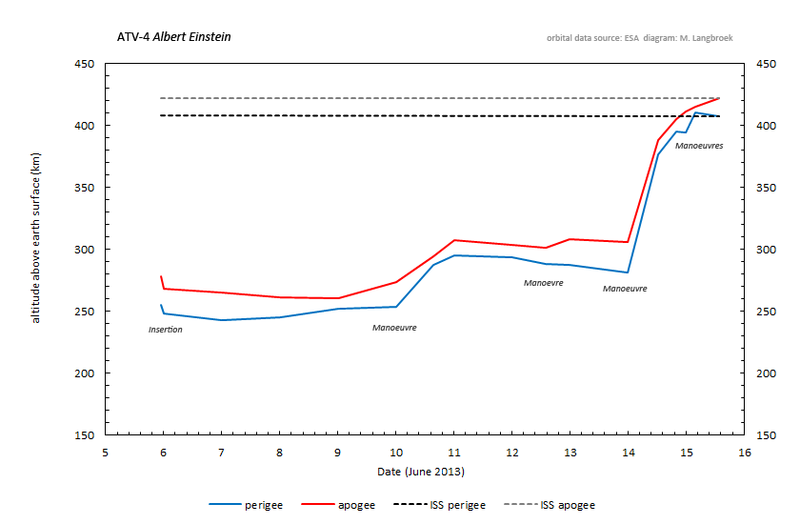 Following my observations of June 5-6 (see photo's and video here) and a visual observation on June 6-7, yet another fine sighting of the ATV-4 Albert Einstein was done yesterday around local midnight. First I watched the ISS pass, followed 17 minutes later by the ATV. 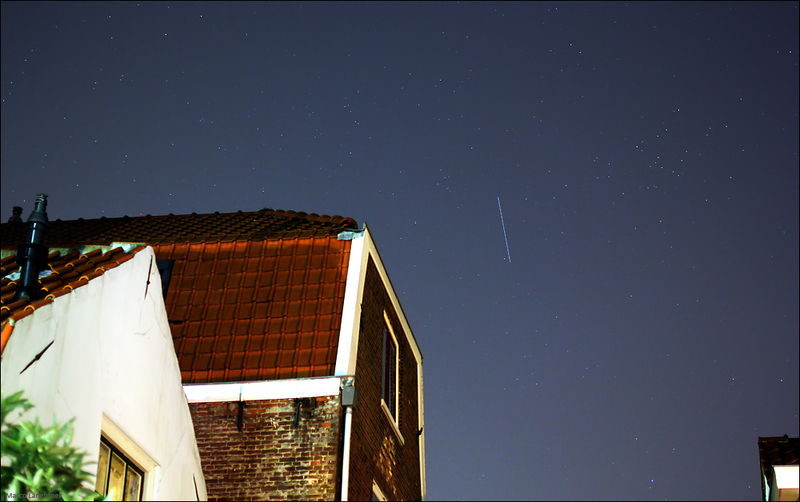 The image above, which is a stack of six images of 5 seconds exposure each (Canon EOS 60D + EF 2.8/24mm, 640 ISO), shows the ATV-4 ascending over the rooftops as seen from the courtyard of my home in Leiden. These two objects are related to the launch of Kosmos 2486, a Russian military Persona satellite, the Russian version of the US Keyhole optical reconnaisance satellites. Kosmos 2486 was launched 3.5 hours before this sighting (at 18:37 UTC on June 7th) by a Soyuz rocket from Plesetsk. These objects have been catalogued as 2013-028A and B - the B object is the leading object in the video above. This would indicate the trailing object is the Persona satellite, the leading object the upper Soyuz stage. 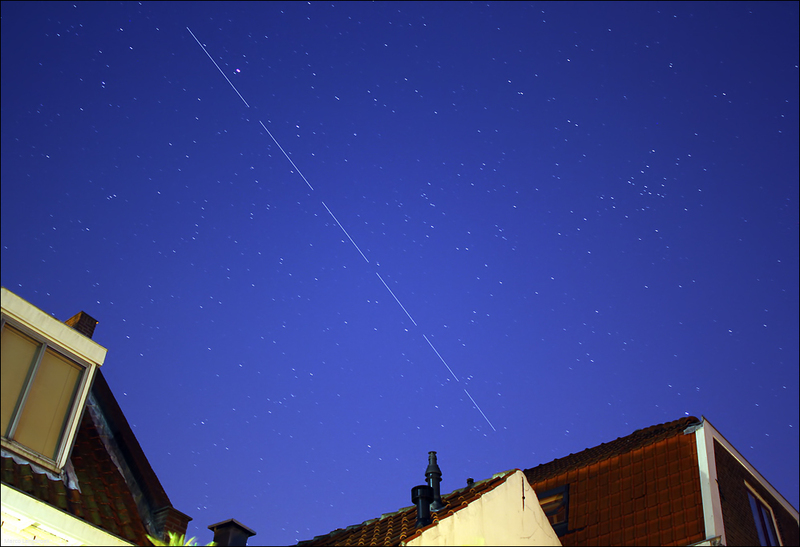 The ATV-4 Albert Einstein, currently on it's way to the International Space Station (see images of passes over Leiden here), does not ascend in a linear fashion. The ascend towards the ISS is in phases. Below is a diagram showing you how the orbital altitude of the ATV-4 spacecraft has developed over the past two days and will develop, if everything goes according to plan, over the coming few days untill it docks to the ISS at the 15th. As the orbit of the spacecraft is not neatly circular but somewhat an ellipse, values for the highest point (apogee) and lowest point (perigee) of the orbit are given. 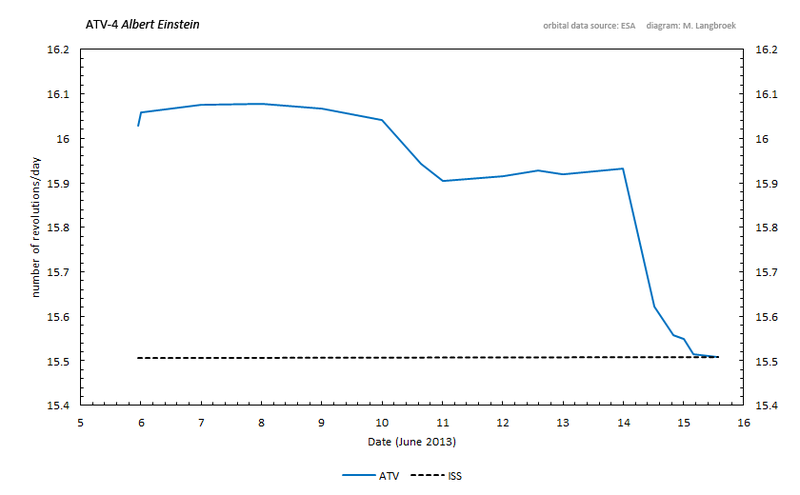 It might surprise you, but over the past two days the orbital altitude of ATV-4 has gradually come down, not up. You can see this in the diagram above. It concerns a slight orbital altitude decrease of just a few kilometers, no more. This is because the ATV is currently just moving in a parking orbit around earth without major manoeuvering. As a result, the orbit currently slightly decays (it is slowly pulled in by Earth as a result of gravity and atmospheric drag): it is very slightly coming down! A major manoeuvre to counter this will occur on June 10th, lifting the spacecraft up from approximately 250 km to approximately 290 km altitude. The orbit will then slightly decay to slightly lower altitudes again, as the ATV will again be drifting. More manoeuvres raising the orbit slightly to counter this orbital decay will occur on June 12th, but the major manoeuvres will be on the 14th and 15th. These latter are the manoevres which will bring the ATV up close to the orbital altitude of the ISS (see diagram above), first bringing it up to approximately 380 km altitude, and then to about 400 to 410 km, and close to the ISS. It will be somewhat in front of the ISS initially, and move closer to the ISS as the orbit is gently raised. A complicated set of manoeuvres then will bring the ATV to the ISS for docking. Note: diagrams constructed using orbital data for the ATV-4 kindly provided by ESA here. ESA successfully launched its 4th cargoship ATV-4 Albert Einstein from Kourou last night at 21:52 UT, loaded with cargo destined for the International Space Station ISS. 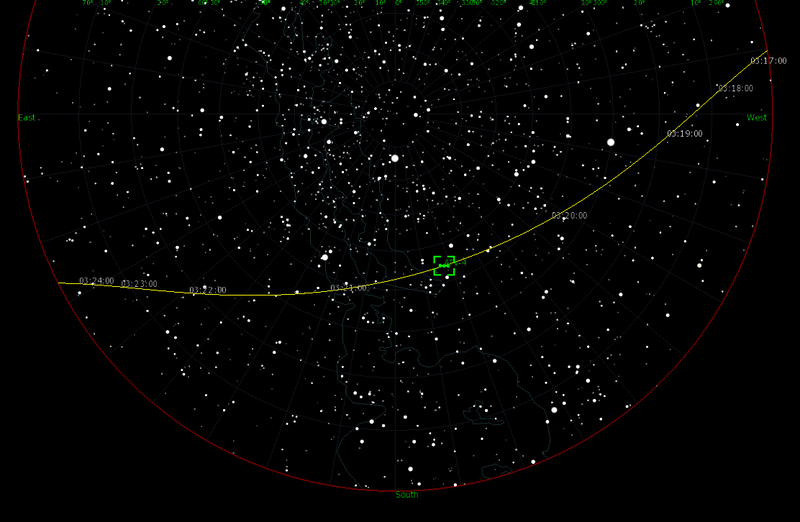 Following the launch it made two visible passes over Leiden, the first of these two hours after launch at 23:47 UT (1:47 am local time) and a second in morning twilight at 1:20 UT (3:20 am local time). The sky was clear and I could observe both passes well. I used both my Canon EOS 60D photocamera and my WATEC video camera to image the passes. 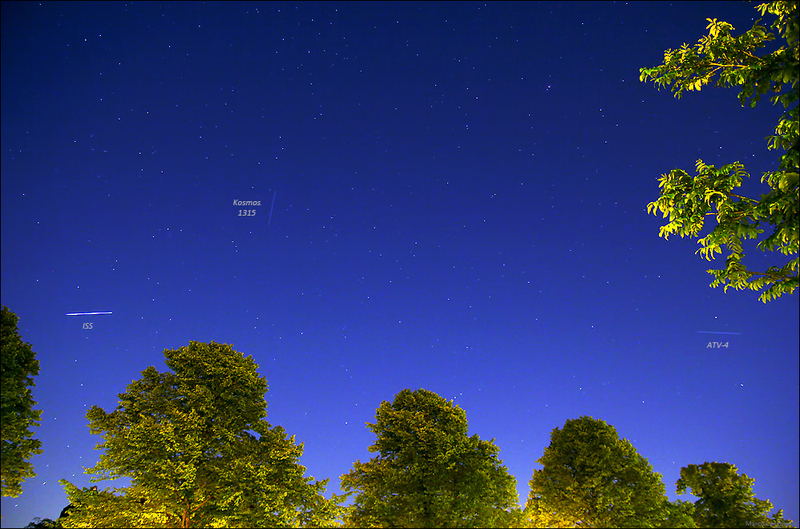 Above is a photograph shot during the second pass (1:21 UT), showing the ATV descending over the old historic Observatory of Leiden. 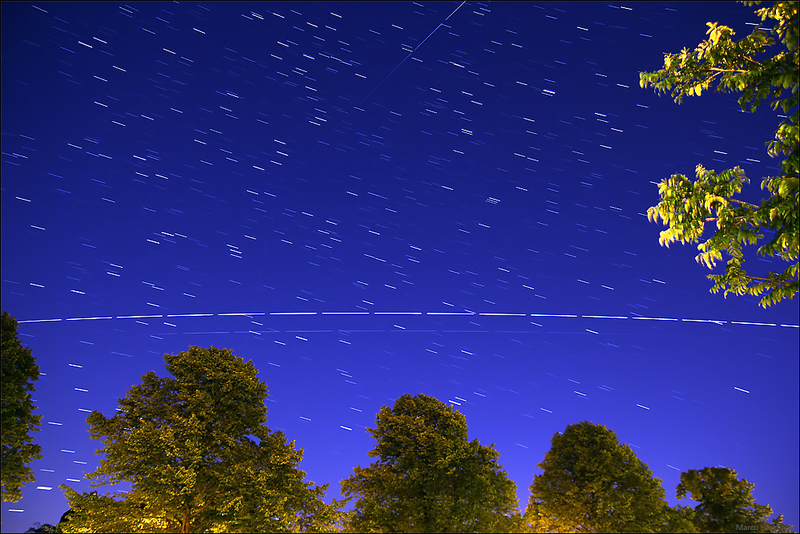 The image is a stack of 8 images of 5 second exposure each, taken in rapid succession. The lens used was an EF 2.8/24mm. ATV-4 was very bright on both passes and easily seen by the naked eye: magnitude +1 on the first pass and +0.5 on the second. It moved quite fast, being in a low orbit at an altitude of about 280 km. 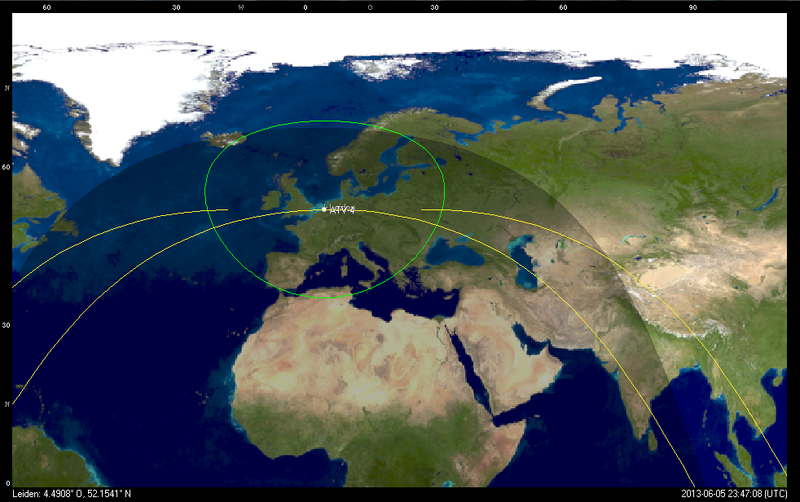 In fact, ATV-4 made a third pass this nigh only 20 minutes after launch, near 22:12 UT (00:12 local time). As it was not entirely clear whether the ATV would be in earth shadow or illuminated during this pass (this early in the launch it is at still very low altitude, below 150 km) I did watch, but as expected it was in earth shadow and not visible. Below are two more pictures from the 23:47 pass. One shows the ATV ascending in the west, close to the Coma berenices cluster. The second one shows it descending in the east, and shows two other (unrelated) objects: and old Russian Soyuz r/b, and the US military satellite NOSS 2-3 E.
If all goes well, ESA's cargoship ATV-4 "Albert Einstein" will be launched from Kourou on top of an Ariane rocket tonight at 23:52 CEST (21:52 UTC). It will dock to the International Space Station ISS on 15 June. A live webcast of the launch will be featured here. 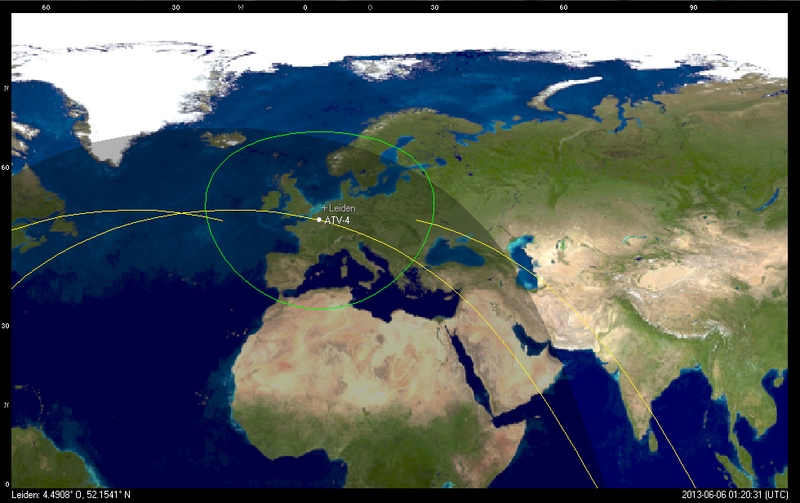 During the 10 days it takes to get to the ISS, it will make several visible passes over Europe, starting the coming night (June 5/6). 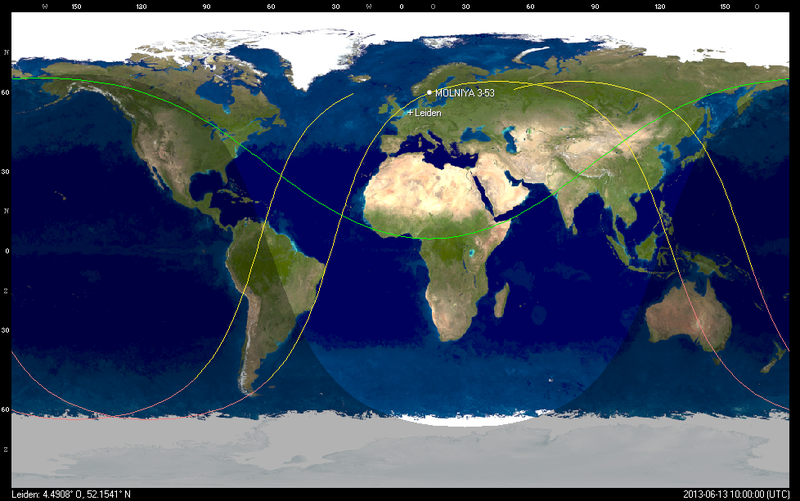 On the night of June 14/15, it will be possible to see ATV-4 and the ISS pass around the same time, closing in on each other just hours before docking. For those of you who want to try to photograph an ATV pass themselves, I have written a tutorial, that is featured on ESA's ATV weblog. Please note that the spacecraft is actively manoeuvering, and this means that the listed pass times are approximate: there might be differences up to a few minutes with the real pass times. If you want to get an accurate sky trajectory map for your own location, then Heavens-Above should have predictions available from the moment of launch. A live ground tracking application is available here (it will tell you over which part of the globe the ATV is, but not where in your sky however). If your are able to run your own predictions (e.g. with Heavensat), then ESA has kindly made TLE's available here. Depending on the illumination conditions, the ATV can reach mag. +1 and hence be easily visible by the naked eye during a favourable pass.